Free download Simple Countdown latest version. It is very simple and useful system utility for your Windows computer. Simple Countdown is also known as Simple Countdown Bar. This application is also available for Linux Operating System. 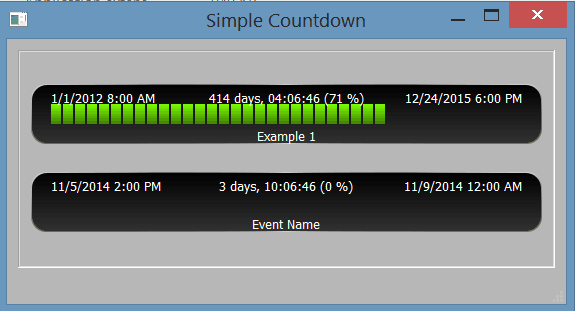 Simple Countdown is developed by Dania Qt and is absolutely free. You can get this application easily by clicking the download link given below. After downloading, you are ready to start this program. There is no need to install it on your computer as it is a portable application. After extracting the folder, open the extracted folder with name “CountdownBarsWindows”. Now open the single folder inside and you will find different files. To run the program, you can run the program CountDownApp. You will see the single bar, that is created by default with the program. You can add more countdown bar according to your wish. It is flexible as you can set any year, date and hours etc for your reminder. Simple Countdown program is required some configuration. This is basic html configuration that you can also edit or add easily according to your requirements. To edit or add more bars, open the file “CounterBarParam”. This is XML file so you can open it with Notepad or Notepad ++. When you open it, you will see some coding as shown in the snapshot below. Skip the first row and copy the code form 2nd line <bar name…. to the end tag </bar>. Now paste it just below end bar tag and before the </document> tag as you can see in picture. To set your start time and end time change the numeric values according to your need. 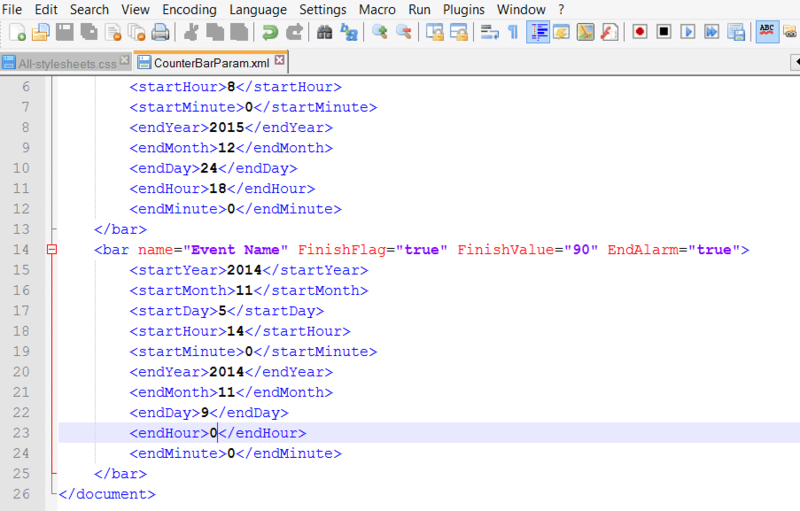 For example, if you want to start counter from current time then set year 2014 between <StartYear> tag. If you want this then it must be like this; <startYear>2014</startYear>. You can see the example in image shown below.